My kids put each other down. My neighbors rush past one another with barely a nod. My colleagues talk to one another without looking up from their computer screens. I, too, am critical, avoid eye contact and value projects more than people. But wait! What am I doing? What is my purpose? I believe I was put on this earth to create community, to write, to teach, to parent, and to love well. So, in that case, I might as well slow down and get to it. Monday is for in-depth writing. Tuesday is for kindness and courtesy. Wednesday is anti-procrastination day (thanks, Flylady!). Thursday is for teaching, training, networking. Friday is for more writing and creating community. Saturday and Sunday, rinse and repeat (and do the laundry). I also want to return to living My Rules. I want Good Orderly Direction — GOD! And just to keep myself accountable, for the next 10 days, I am going to post every day either here or at mbcoudal.com. Because it’s good to have a plan, even if I don’t stick to it. And my plan is to be less rushed at work and kinder at home; (yes, kinder at work and less rushed at home). 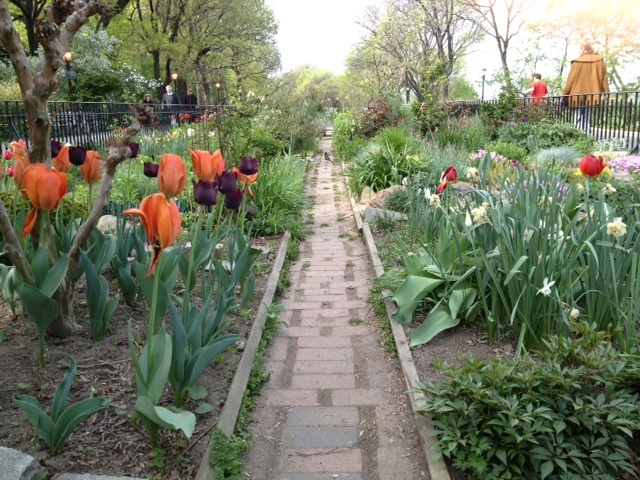 So, stop and smell the flowers in Riverside Park. That kind of thing.